Wow, a rare find in heart of the Greenville Eastside on 1.7 ACRES of private reserve tucked into a quiet CUL-DE-SAC! Featuring an updated, kidney shaped GUNNITE pool with new diving board, and a POOL HOUSE for ultimate convenience in entertaining. The pool house includes a full bathroom, workout rooms, shop, and covered serving area with BAR SEATING. A new HVAC MINI-SPLIT in GARAGE provides conditioned air for car work, ping pong or whatever you dream up. A huge PAVED PARKING area (approx. 51 x 78 ft) provides plenty of space for all your gatherings, a great basketball game, or RV PARKING with hookup. 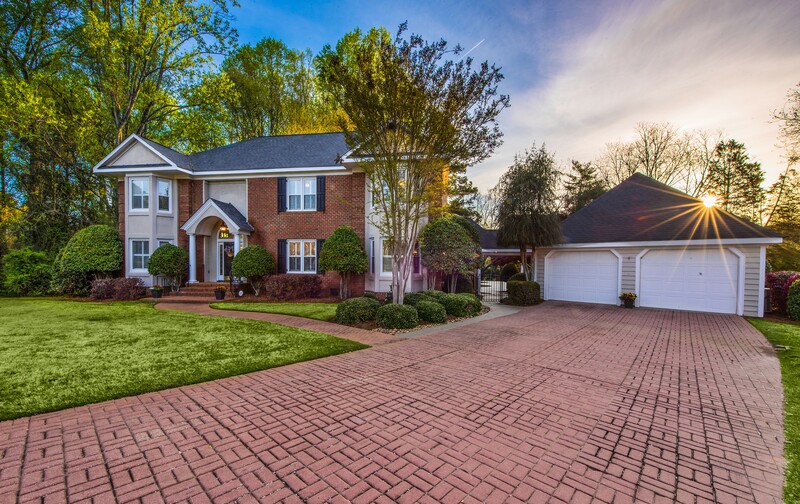 This fabulous executive style BRICK home has a classic look with a stylish PAVER DRIVEWAY. Inside is a nicely appointed custom home with 9’ CEILINGS on the main floor, a lot of freshly painted living space, plus an office and EXTRA BEDROOM in the MAIN FLOOR -could be a second master suite. Chefs will love the UPDATED KITCHEN with stainless steel appliance package: 5-BURNER JennAir gas stove, double CONVECTION ovens, Bosch dishwasher and large capacity stainless refrigerator. A large ISLAND with custom wood top, cabinets with PULL-OUT DRAWERS, loads of counter/work space make for easy cooking. The kitchen opens to a KEEPING ROOM / eat-in area that will be the life of the party, with guests mingling and enjoying the space. Wide windows in the keeping room provide a great view of the pool activity and the wooded backyard. For larger gatherings, hosts will appreciate the large formal dining room. And what a grand great room! Find soaring ceilings, recessed lighting, custom wood walls, and an artistic 18‘ ROCK FIREPLACE. A wet bar adds convenience for entertaining or tucks away as needed. Tall windows in the great room bring in a lot of NATURAL LIGHT, views of mature trees, and French doors take you outside to a large DECK overlooking the pool area. A 5th bedroom on the main level could be a SECOND MASTER SUITE with large bathroom, granite counters, and plenty of storage – great for guests too. Check out the inviting EXECUTIVE STYLE OFFICE located off the foyer - plenty of space for a big desk, brand-new hardwoods, and additional light coming in from a bay window. Fantastic freshly REFINISHED HARDWOODS run throughout the main floor, and PLANTATION SHUTTER accent windows on the front of this home. Upstairs are 3 large bedrooms, and a HUGE MASTER SUITE featuring a gas logs fireplace, balcony, built in desk, and large bathroom with updated GRANITE counters. Spacious hall bath has granite counters too. The bedrooms upstairs are large and have WALK-IN CLOSETS creating plenty of storage space. Do not miss the massive storage space in the attic that will make your eyes pop. Upstairs laundry has nice washer and dryer that will convey. New CARPET upstairs with lots of fresh PAINT. New TANKLESS WATER HEATER. Garage has new door openers and EPOXY FLOOR Handymen will love the WORKSHOP with peg board walls and double doors for easy access. Workout in the EXERCISE ROOM that is set up with cable for TV. The CABANA KITCHEN has a sink, cabinets, refrigerator space, and corner cabinet storage – ready to make your next party a success. The LANDSCAPING here is stunning with RIVER ROCK beds, mature Japanese maples, IRON GATES, and a full yard 8-zone IRRIGATION SYSTEM. Sellers had an awesome zip-line in the back yard for years – no longer there but the location is perfect. Large backyard BRICK GRILL can really handle a large crowd! Pool pump is 2 years old. Generac GAS GENERATOR is 20w. No HOA on this property. LOCATION, LOCATION, LOCATOIN – super close to Patewood medical center, Haywood Road and Pelham road amenities – this home is real winner!